NDERA, Rwanda – We dived straight into lessons here at Gardens for Health International (GHI): six Barefoot MBA topics for GHI’s field officers and a little Kinyarwanda for me. Sunday, GHI’s program associate, facilitated both. Today was the first day on the job for the five field officers, whose energy brought to life their afternoon of lessons. GHI selected the field officers from a pool of 160 through process that, based on field officers’ questions and insights today, was much more rigorous than the Barefoot MBA. Sunday spent the summer adapting and translating the Barefoot MBA, so after a brief run through this morning, he was ready as scheduled to teach the field officers. We’re teaching ten Barefoot MBA lessons to the field officers, who later this week will teach three to cooperative members. The field officers listened intently as Sunday taught profit, saving and investing, the three lessons they’ll teach in the field this week. They actively participated in the investing activity, which showed month-by-month growth of the dodo vegetable (sprouts can be sold for up to double the cost of seeds), hens (produce 30 eggs a month, which can be sold for 80 Rfw apiece) and rabbits (multiply like rabbits!). They understood that saving cash can be safe, especially in the short term, but does not generate value over time. They picked up on the seasonality of a dodo investment. And they pointed out that rabbits multiply so quickly that their seller might not be able to find enough willing buyers. Reassured that they’d practice teaching profit, saving and investing to each other before heading to the cooperatives, the field officers were ready for more. Sunday taught them spending, planning and records, and production, which they picked up just as quickly as they did the first three lessons. He gave a quick overview of the lessons we’ll teach next and then asked the field officers if they had questions. “What is MBA?” they asked. Sunday explained. The group was amused as it tried to translate ‘Barefoot MBA’ into Kinyarwanda, not a simple task here, where brevity and MBAs are rare. Their solution was my first lesson in the local language: rwiyemeza mikimo w’ikirenga utagira n’inkweto, which literally means a master good entrepreneur with no shoes on. I told them I’d rather start by learning the word for ‘thank you’: murakoze. 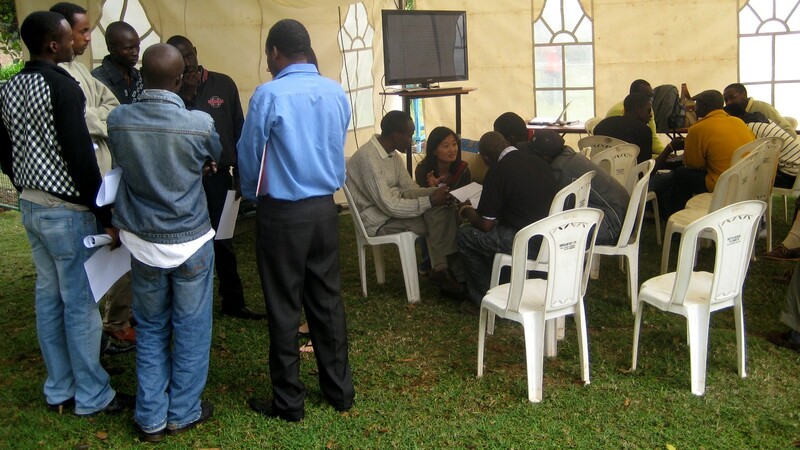 NAIROBI – A few minutes before our stated start time of 10 a.m., our tent was empty. Well, except for a few chairs. The rain had just passed, and makers were still setting up. Some asked if they could use our chairs at their booths. They saw no signs of a workshop. But this is Kenya, and things here run on Kenya time. Our workshop was no exception. We delayed our start time to 10:30, and then 11, and by 11:15 a handful of people had gathered – not as many as we hoped, but enough to start teaching. By 11:25, every seat was filled. By 11:30, people brought their own chairs. We were finally underway. Like yesterday, we started with pairs of contrasting stories that are the core of the Barefoot MBA lessons. And like yesterday, participants caught on right away: Production is important because it adds value and allows sales at a higher price, leading to higher profits. Marketing is about understanding wants and needs; if a customer understands why he needs a product, he is more likely to buy it. Also like yesterday, we illustrated the lessons with an activity adapted from our initial pilot in Thailand. This time, two teams made and sold bicycles to each of six buyers with specific demands. We limited the production capacity of each team, and at first each wanted to produce as many generic bicycles as possible. One team quickly shifted strategy, though, choosing instead to sell fewer high-quality, customized bicycles at a higher markup – and eventually outselling the other team. The different strategies led to a discussion afterward of specialization versus diversification. Ultimately, the conversation returned to marketing. Participants applauded when the session concluded, and we thought we were done. Then came the best illustration yet of Kenya time: just as we wrapped up, a handful of our most engaged students from yesterday approached our tent and asked when today’s session would begin. NAIROBI – The 100 or so makers here at Maker Faire Africa come from all over the continent, largely from Kenya but also from countries like Burundi, Ghana, Rwanda and South Africa. Their products span a broader array, from hand-crafted mobiles to water pumps, eggshell art to stoves made from burning trash. But at the Barefoot MBA workshop, participants had a singular focus: learning basic business. Our first day’s session taught profit and investing using stories and an interactive activity we adapted from our initial pilot, in Thailand. 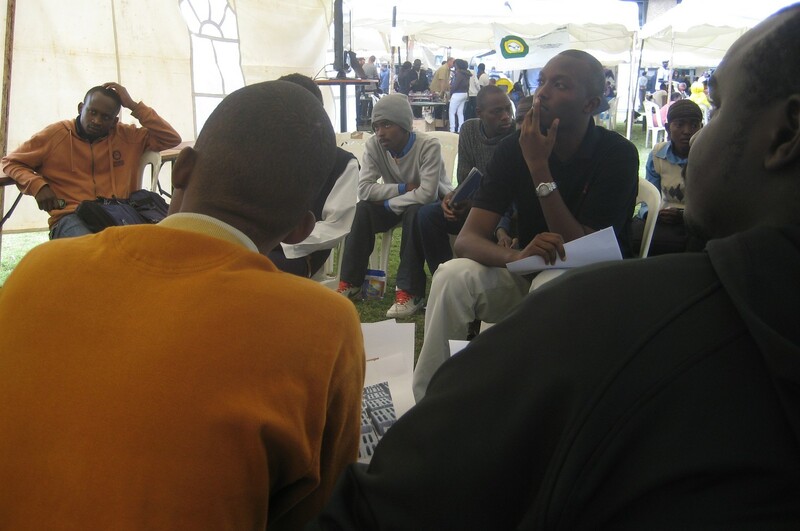 Our 25 participants engaged in the stories and actively participated in the questions that followed. They were enraptured, though, by the activity, which illustrates interest by showing the value of several equal investments over the same time period. Participants understood immediately; later, those who walked by our workshop said they could tell by body language and laughter alone that participants were learning. In the discussion that followed, participants answered our questions and asked some of their own. When asked for other examples of investments they’d made, one even said he just sold eight cows, six more than he bought several years ago. When someone else asked what he should invest in next, we underscored the importance of investing in familiar areas – imagine if someone who’d never seen a cow suddenly owned eight or even two. Overall, feedback was positive. 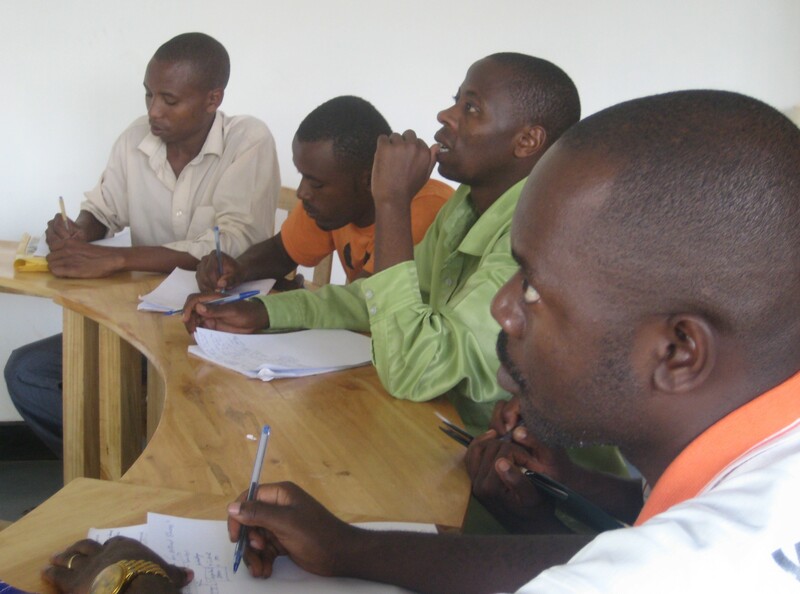 A participant from Burundi asked how he could use the Barefoot MBA at home. Others said they’d bring their friends to tomorrow’s session. And we heard later from event organizers that people asked why we weren’t teaching the other fourteen Barefoot MBA lessons. Come back tomorrow for two more, we said. And then enjoy the rest of Maker Faire. NAIROBI – Tomorrow is a big day here in Kenya. The country will celebrate the promulgation of its new constitution in front of hundreds of thousands of spectators and dignitaries like Kofi Annan. And at the University of Nairobi, Maker Faire Africa will begin. MFA is expecting some 100 makers – innovators, inventors and other creative entrepreneurs – for two days of idea sharing and community building. This afternoon, the grounds for MFA were but a collection of tents on a flat campus field. Tomorrow, those tents will be transformed, many into exhibition space. 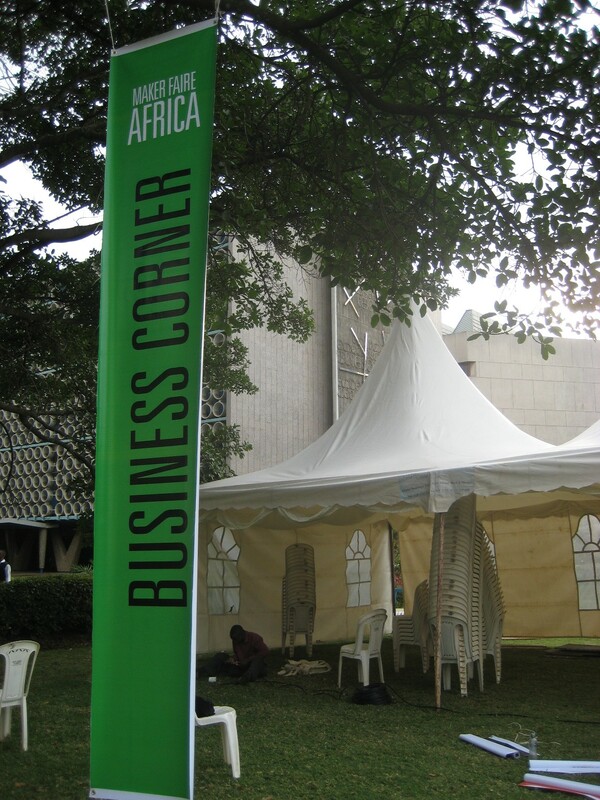 One tent already has an official “Business Corner” banner, formalizing a two-day home for the Barefoot MBA. Joy and I will spend the morning talking to makers so that after lunch we’ll be ready to teach our first lessons, on saving and investing. 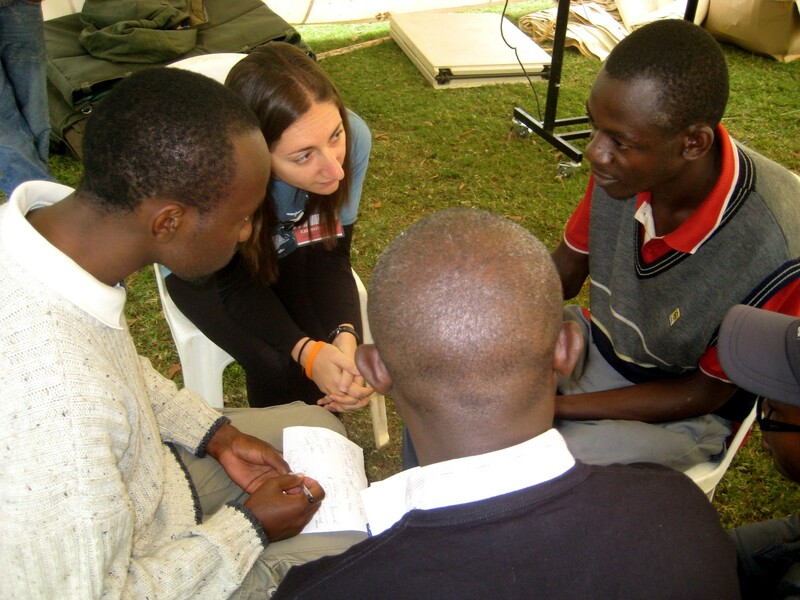 Two groups in Africa have invited us there to implement the Barefoot MBA. Katherine has been working remotely with them to adapt our materials and will travel to Kenya and Rwanda to visit markets and gardens, meet teachers and students, and run workshops. Maker Faire Africa describes itself as “a celebration of ingenuity, innovation and invention.” Its event last year drew more than 900 to Accra, Ghana, for workshops, seminars, lectures and other showcases of innovation meant to spur collaboration across the continent. The Africa News video brings last year’s event to life. Feedback from Maker Faire 2009 was positive but included a cry for basic business education — exactly what the Barefoot MBA aims to teach. Katherine is working with Joy, who has helped organize the event, to adapt the Barefoot MBA for the makers expected to attend the Maker Faire business basics workshop, which she and Joy will run on August 27 and 28 in Nairobi. Gardens for Health International (GHI) enables people living with HIV / AIDS to improve their nutrition and health through low-cost, sustainable agriculture practices. GHI’s country director, Julie, says its cooperatives have a real need for our training. GHI usually is the first to extend credit to its members; it wants to build an integrated training program so clients can access loans from a range of institutions. To date, GHI’s trainings have been mostly in agronomy and cooking. GHI is bolstering its training but largely in agriculture, where its strengths lie. Katherine, Julie and the GHI staff are adapting and translating the Barefoot MBA for GHI’s cooperatives to ready for their work together in Rwanda the week of August 30. We’ll spend the beginning of our time together visiting cooperatives and community gardens and making final adjustments to the lessons. Then, as we successfully did in the Philippines, we’ll run a train-the-trainers workshop for GHI field officers and then watch as they teach the Barefoot MBA lessons to cooperative members. Though these are not the first African organizations to use the Barefoot MBA, they are the first to host either of us in person. We’re excited for what this means for the Barefoot MBA and our partners. Please check the blog for Katherine’s East Africa updates. We’re thrilled to announce a partnership with Gardens for Health International, an organization in Rwanda that helps people living with HIV / AIDS improve their nutrition and health through low-cost sustainable agriculture practices. GHI, which counts an Echoing Green fellowship among its accolades, enables its constituents to form small business cooperatives and access arable land. It also provides microloans and identifies and provides initial business investments. GHI delivers training, but to date that has been limited to nutritional training. We are working with GHI to adapt and implement the Barefoot MBA to add basic business to the training GHI constituents receive. 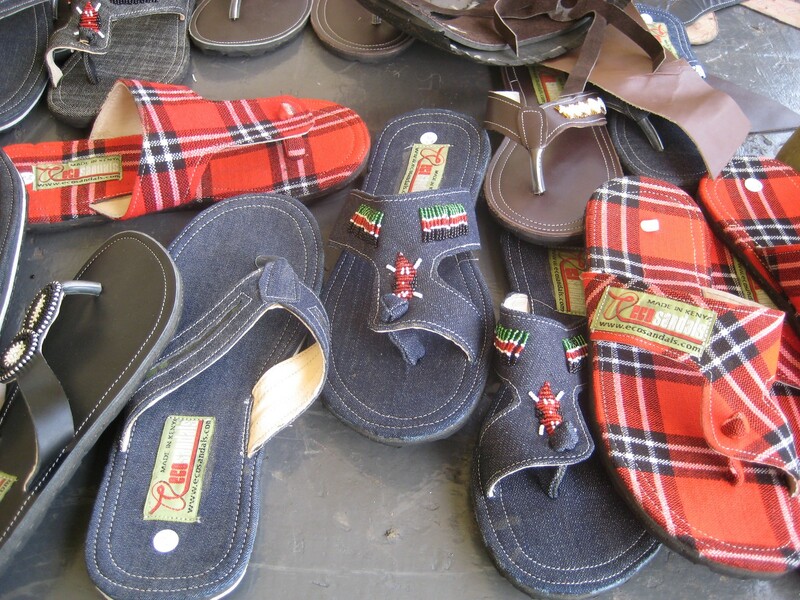 A microenterprise program in Malawi is using the Barefoot MBA for a two-part training session. 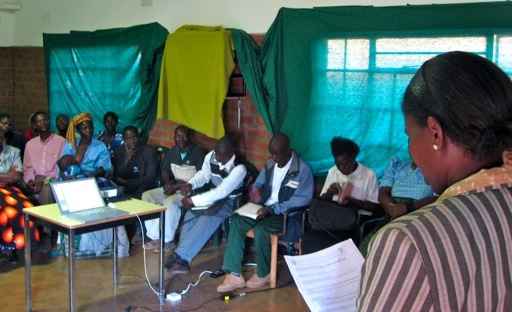 A group at St. Gabriel’s Hospital Namitete adapted all the lessons to teach some 100 community healthcare workers and HIV support groups and translated at least six into Chichewa, the local language. Jasper, an intern for the hospital, is keeping a blog about his experience. 1. Despite the fact that we had conducted field research visiting the various HIV support groups, we still do not fully understand how much our students do and do not know. 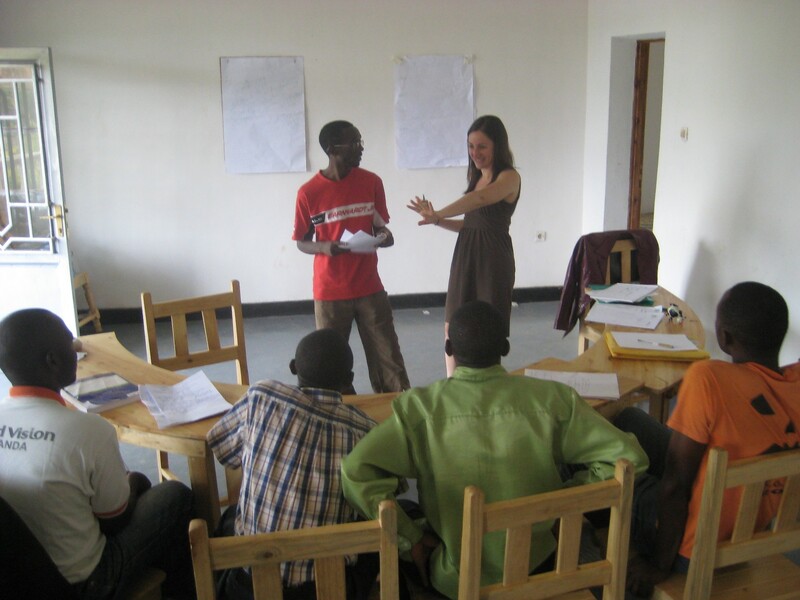 The flexibility and comprehensiveness of Barefoot MBA allows our HIV support group liaison (Angela) and community healthcare volunteer liaison (Alexander) to select the appropriate lessons based on their experiences with both groups. 2. Although we know that our students will have a primary-education background, we’re not exactly sure what that entails. The follow-up questions that Barefoot MBA has after each story demonstrating a concept gradually increase in difficulty, and this ensures that we can cater to the learning ability of all of our students. 3. It is a burden for HIV support group members and community healthcare volunteers to travel long distances to attend trainings at the hospital. Therefore, we are limited to 2 sessions that are 3 hours each. The flexibility and simplicity of each Barefoot MBA lesson allows it to easily stand on its own or in combinations. For example, if community healthcare volunteers need to come for a medical-related training at the hospital, a Barefoot MBA lesson could also be easily and quickly implemented at the end of the training. At the first training sessions, which taught and reinforced basic business concepts, students embraced the lessons by repeating the stories, which Jasper writes is typical of the Malawian learning style. Students engaged in energetic discussion about the stories and topics. The next session will focus on implementing the concepts they learned at the first session. It will be taught in conjunction with receipt of a loan, which typically proves difficult because of logistical complications and stringent training and planning requirements. Jasper and his team hope the Barefoot MBA-based trainings help overcome the latter set of barriers and help their students receive and responsibly manage capital for their small businesses. Upon completion of their training sessions, Jasper and his team plan to make their Barefoot MBA adaptation available to everyone. We plan to post it to this site when they do. The organizers of a conference in Africa aimed at identifying, spurring and supporting local innovation are using the Barefoot MBA to help participants understand business basics. Maker Faire Africa brings together makers to drive and celebrate ingenuity, innovation and invention on the continent. MFA held a successful inaugural event in Accra, Ghana, last year and is organizing a follow-up event this summer with another in Nairobi, Kenya. We are working with MFA to give this year’s attendees — who largely have relatively low levels of formal education, live in rural areas and have businesses at varying levels of development — the knowledge they need to solve problems themselves. We also hope to attend the event.